As stated, the first step toward successful rat trapping is to seal up all entry points into a house. Only then should you bother to even start trapping - if you don't seal up the holes, new rats will just keep coming. If you need help with a rat infestation, click on this map of Professional Rat Removal Companies serving every town/city in the USA. I have done maybe 1200 rat control jobs in my life, over many years. I have tested many methods, and changed my approach many times. During my first year and first 50 jobs as a rat removal company, I had a lot of problems, and had to keep working on it. But I was persistent and experimented a lot, and I believe I have come up with the very best systems to trap rats. My current success rate is always 100% - I solve the rat problem permanently within days. So I know I have it right now. How much does rat control cost? Get rat extermination prices. FIRST STEP - Of course, as stated, rodent trapping is pointless unless you know you've blocked off all the entry points into the home. If not, new rats will just keep coming in, and you'll have to keep rat trapping forever. And also, once you've sealed off the holes, there are a few rats stuck inside, and they suddenly become EASY to trap. Get them, and the job is over in a few days. SECOND STEP - Set snap traps. In fact, I'm going to recommend a brand. The original wooden Victor snap traps. I have tested about ten different snap traps thus far, and many are of clever design, but absolutely none work better than this model. You can set it at a very sensitive level, on many different surfaces. Now, here's the key - LOCATION IS EVERYTHING. Some lazy rat trapping companies just put a few traps around the attic hatch door. That won't cut it. You've got to inspect the whole attic, and find out where the rats are running. The run the same paths over and over and over. These paths are easy to see - they are covered in rat droppings and brown grease, and they are trampled down. Just set the traps right across these rat runways. And how many rat traps should you set? I always set at least a dozen. The more the better success you will have. What about rodent bait? You don't even need to bait the traps. I'm telling you, bait does not matter. But if you must use bait, peanut butter is great. Some people use Slim Jims, chocolate, etc. But what bait do you use to trap a rat does not actually matter nearly as much as the location of the trap. THIRD STEP - Monitor the traps, remove all dead rats from the traps and reset. You ought to check the traps every day or every couple of days, before the rats start to decompose and stink. Once you stop catching rats, and once you stop hearing them running and scratching and scampering in the attic and walls, you know the problem is solved for good. Can you use a humane live cage trap? Of course you can! I've done so many times to make customers happy! But unfortunately, here's the deal. Rats are incredible creatures of habit. They are very attuned to their environment. You may not believe it, because I was very surprised when I first read it, but it's true: the rats that live in your home and attic occupy an extremely small territory. They will rarely venture more than 100 feet from their nest. They don't roam around the neighborhood. If they can't find what they need in a small space, they don't survive. Rats that have to travel around get killed by predators. Rats that venture into another rat's territory get killed. A rat that does not have its home nest will definitely die within 48 hours. So the problem with a live cage trap is that if you catch a rat alive and relocate it somewhere outside, it's toast anyway. So why not quickly and humanely kill it? Oh, and live traps are simply less effective. And if you don't check them at least twice a day, the rats trapped inside will die of stress exhaustion. And as stated, you ought to set a dozen traps - do you have a dozen cage traps? Can they fit into the tight gaps that rats live in? Finally, I'll quickly address glue board traps. There is no reason to use this type of trap. It offers no advantage over a snap trap. I've been to many houses where the customer or a prior pest control company has set glue boards, and I see a lot of rat footprints, rat fur, even chewed-off rat limbs. So they don't always work. And they are BY FAR the least humane of any trap. And they are not reusable. So take that into consideration. 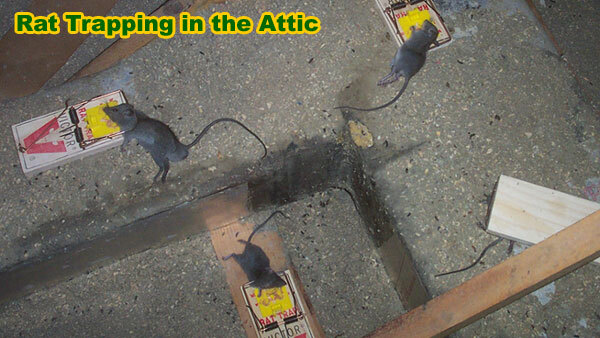 How to trap a rat in the attic - set snap traps on the common areas rats run - the trails with rat droppings and trampled insulation. How to trap a rat in the basement - set the traps along the edges, along the walls, and everywhere you see rodent feces. How to trap a rat in the building - best trapping methods are where the rats frequently go - there's no point in setting where rats never run. How to trap a rat in the ceiling - if it's a drop ceiling, remove the panels. That's a great spot. If not, you've got to go into the attic and set there. In between floors is inaccessible, so you have to find another spot where you can reach and set snap traps. How to trap a rat in the garage - set the traps along the edges, along the walls, and everywhere you see rodent feces. The entry holes are great too, such as the corners of the garage door. How to trap a rat in the garden - it's dangerous to set snap traps outside, so a cage trap or a trap locked in a Protecta box is the best bet. How to trap a rat in the house or home - if it's in the house, you'll probably want to set the traps in areas that are safe, such as behind the furniture, behind the oven, or in the cabinets in the kitchen. Be sure to be careful! Rat Trapping Tips: Getting your house back to rat-free after an infestation can be quite the task. One method with a good track record at achieving this is the use of traps and baits. There are basically four types of traps that can be used to control rats and they are: Snap traps, Glue traps, Poison traps and live traps. When a rat lured by the bait sets off the trigger of a snap trap, a wire snaps across the neck of the rat killing it instantly. The trick is to get a big enough snap trap so that once the wire snaps, it kills the rat. A small snap trap might just injure but not kill the rat. The good thing about snap traps is that they can be re-used but if you are too humane to watch a rat die this way, you should probably skip it because it involves blood and sometimes urine as the rat dies. Glue traps are pads that are covered with thick adhesive and a bait in the middle. The rat in wanting to get to the bait in the middle gets stuck on the glue and as it struggles to go free, its mouth gets stuck too leading it to suffocate and die. The bad thing about a glue trap is that it doesn't catch all rats and sometimes the rat doesn't die quickly enough, leaving you to kill it yourself. Also the adhesive dries out after a long period leaving it ineffective. Poison trap involves a pre-packaged poison that is kept at a spot frequently used by the rat(s). The bait will be coated with the poison so the rat eats the bait, unknowingly ingesting the poison and then goes off to die in some obscure place. The bad thing about this sort of trap is that you'd have to constantly worry about your little children and/or pets if you have any, stumbling on the trap. Another thing is, if this trap is indoors, the rat would probably die in an unknown place in the house and would begin to rot. These kind of trap is usually in the form of small metal cages. A bit of poisoned bait is placed on a pressure-sensitive pad so that once the rat steps on the pad to take the bait, the trap door snaps shut trapping the rat in the cage. The cage must not have gaps in-between its steel mesh that measure up to a half inch because a small rat can squeeze through a space that small. This kind of trap is effective if you have only one rat in the house, unless you would have to empty the cage each time you need to catch another rat. After live trapping a rat, you may transport it far away from your house and release it back into the environment; you may also turn it over to your local animal department if you would rather not kill it. Baits are the food pieces that are used to lure rats into traps, and they are poisoned most of the time. The kind of bait to be used depends on the kind of rat that you want to get rid of. Black rats are vegetarians while brown rats eat plants, food and meat. Rats cannot vomit what they've eaten and so they are likely to eat the same bait over and over again. The best baits are the smelliest ones because they attract the rats more. Liquid bait is also very potent. Peanut butter – it is usually sticky and rats cannot sneak it out of the trap unlike cheese. The rat is compelled to stay and eat it, during which time the trap door or wire is triggered off. Meat: Brown rats love meat but you have to use meat as bait with utmost caution, especially if you have domestic pets or little children around the house. Fruits and vegetables are mostly attractive to black rats but the fruits have to be constantly changed since rats cannot eat rotten or spoiled fruits. Go back to the Rat Removal page or the How to get rid of rats page. My Response: What traps are you talking about? I use many types of traps for many different types of animals. All are humane, so please explain what trap you are looking at. My Response: Oh, you were talking about snap traps for rats. I wasn't sure what animal or trap you were referring to. 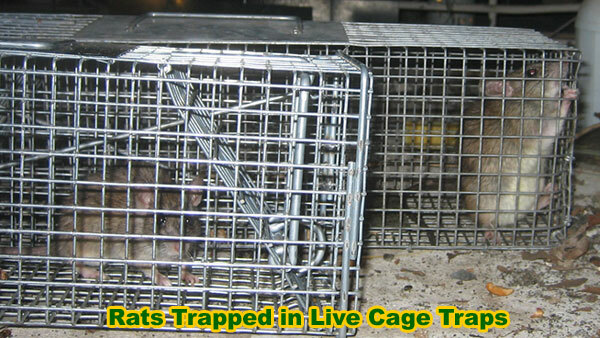 I usually use live cage traps for all animals, except for rats. The thing is, if you live-catch rats in cages, or if you use one-way exclusion doors, they are going to meet a worse fate than a snap trap. I've studied this for a long time and I can't find a better alternative. Also, when I set traps correctly on runways, the kill rate vs. the misfire rate is about 95%, I'm not kidding. But ANYTHING is WAY better than using poison.